The stars, triangles, and markings in this poster are symbols used by the Nazis to isolate and identify their victims. Almost everywhere under Nazi rule Jews were forced to purchase and wear a six-pointed star of David whenever they appeared in public. The yellow or blue star was worn on an armband or pinned on a shirt or coat. 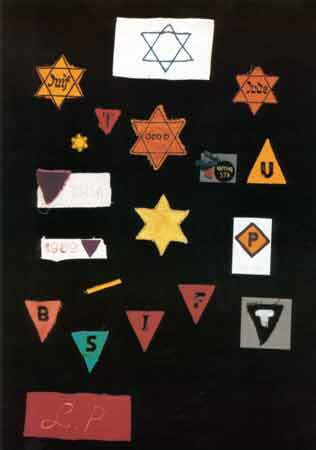 Concentration camp prisoners wore triangular badges that identified them by their arrest category. Many badges also identified the bearer's race or nationality. 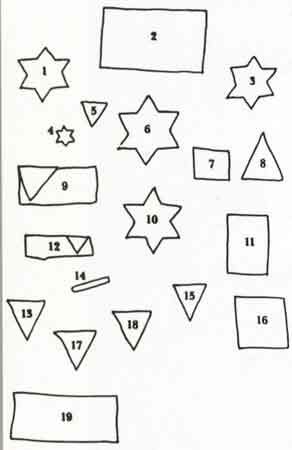 Yellow triangles were for Jews, red triangles for political prisoners, purple for Jehovah's Witnesses, pink for homosexuals, green for criminals, black for Gypsies and "asocials," and blue for emigrants. Letters printed on badges usually indicated nationality. (2) Star of David armband, General Government, ca. November 1939-May 1943. Source: United States Holocaust Memorial Museum. Photograph by Arnold Kramer.